I received a proof copy of Six Tudor Queens: Katherine of Aragon, the True Queen as a member of the reader review panel for Lovereading.co.uk. It’s the first book in a series of novels about Henry VIII’s Queens and is due to be published in May 2016. This is fictional biography at its most straight forward, written in an uncomplicated style. Told from Katherine’s point of view it follows her life from the time she arrived in England at the age of sixteen to marry Prince Arthur, the elder of Henry VII’s two sons, to her death in 1536. I knew the brief facts about Katherine, the daughter of Isabella and Ferdinand of Spain, married first to Prince Arthur and then to his brother Henry after a papal dispensation allowing the marriage after Arthur’s death; her subsequent failure to produce a living male heir, suffering a series of miscarriages; the only baby to survive was a daughter, Mary; and her divorce in 1533 from Henry VIII, who was by then besotted with Anne Boleyn. This novel fills in the facts in great detail including the question of whether her first marriage was consummated. Katherine maintained it wasn’t and based on research Weir takes her word as the truth. In her Author’s Note she refers to recent research by Giles Tremlett and Patrick Williams that shows ‘we can be fairly certain that Katherine’s marriage to Prince Arthur was not consummated and that he died of tuberculosis.’ She cites the basis of her account of Arthur’s illnesss on Dr. Alcaraz’s testimony, given on 1531 at Zaragoza. She portrays Katherine as a determined woman who never ceased loving Henry and above all who did everything she could to protect the legitimacy of her daughter. Katherine is portrayed as a woman of her time – obedient to her parents and her husband, conscientious about doing her duty and active in maintaining an alliance between England and Spain. But even so, she resisted Henry in his demands for an annulment of their marriage. She was heart-broken both at her failure to produce a living male heir and to keep Henry’s love – because they were in love at the beginning – and maintained that she was the true queen right up to her death. I tend to forget the length of their marriage, glibly remembering the mnemonic ‘Divorced, beheaded, died, divorced, beheaded, survived‘. Katherine and Henry were married for over 20 years. I did get tired of the account of their endless wrangling, going over and over the same arguments, never getting anywhere – but then I suppose that was how it was for them both. Overall I enjoyed this book. It’s a long and comprehensive study, which has increased my knowledge and understanding of Katherine of Aragon and the early 1500s. It is obviously based on extensive research and written with great attention to historical accuracy, but in places this made it tedious and too drawn out. I saw this on NetGalley but didn’t realise it was a fictionalised account. I’m tempted, but 624 pages – ouch! Still, it’d be nice to hear the story from Katharine’s point of view – she does tend to get a bit overlooked, with her story usually only being told from the point where Henry wants to divorce her. I’ve always thought that Katherine was the one true heroine of the Tudor era. 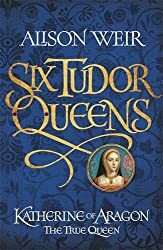 I’ve read The Six Wives of Henry VIII, so I assume similar ground is covered by the same author in this book, but I enjoyed the Katherine of Aragon section the most. I like the sounds of this as I would love to hear from Katharine’s point-of-view – I think we all forget how long they were married compared to the subsequent marriages! I will have to make a note of this one.